The Fuhrer has returned home to find his bright, wide-eyed boy, Selim, waiting for him. The boy is given a train as a birthday gift from his beloved father. Inside the same dwelling, Envy has returned with Al. The evil homunculus confirms that this is the place where the one who is manipulating them is staying. Edward enters a temple and sees Russell and Fletcher. This is the place written in their father's letter. Seems their father had come to Central to research the red water. Once here, he found out about the 5th laboratory where he met an alchemist. He was told that to transmute the water into the philosopher's stone, the use of human lives was essential. He also revealed the location of the true laboratory. Seems the 5th laboratory was just an entrance to an even bigger human research facility. Edward uses alchemy to make an entrance. He tells the other boys that he must go alone. Russell speaking: "According to Father's diary; if you enter this temple and go deep underground, suddenly Under Central, you'll find another city. Father estimated from the architectural style that it was close to 400 years old. There is a legend, that back then, where Central stands today, there was a city that disappeared in one night. Father performed experiments related to the very nature of alchemy. Was the whole city trapped and taken underground? That's what he thought". Ed can't believe someone could sacrifice a whole city and immediately believes his own father is at fault. Inside the same building Dante (as Lyra) waits for the arrival of the Elric brothers. Wrath comes in frantic. He's desperate to have Sloth (who he believes is his mother) revived. Lyra orders Envy to take care of the unruly child. Back at headquarters, Izumi is taking on Archer and the rest of the military. She's about to meet her maker when Lieutenant Ross, Brosh and other military allies save her. Returning to Ed....he has made his way to an elegant hall where he finds Rose dancing to music. There's a brief scene switch to Scieszka and Winry, then we return to the hall where Ed is now dancing with Rose. After a few minutes, Lyra enters with Rose's baby. Rose happily takes her baby, and leaves Ed and Lyra talking. Imagine the woman's surprise when Ed reveals that he knows she is Dante! She admits that this body isn't even the tenth. Ed is furious that she and his father use sneaky moves to create the stone and use it only so they can live on! They make it so anyone who is close to the stone when it is created is annihilated....thus only a mere legend remains. "Humans cannot handle the stone," Dante says and claims she is protecting the world by taking the stone before a human can do something foolish with it. Suddenly Gluttony bursts through the doors searching for Lust. Lyra sicks him on Ed. The boy tells the distraught homunculus that the one he seeks is dead....Wrath had sealed her. Gluttony sadly releases Ed's arm and slowly walks away. Ed turns to Lyra and the two have a showdown. He discovers her body is rotting and is not surprised for she has not practiced the rule of equal trade. Lyra says that there is no such thing as the Law of Conservation. She uses examples to prove herself right. One involves grabbing Rose's baby. Ed saves the baby telling Lyra she shouldn't use it to prove a point. "You're like your father after all," she says. When Ed turns to look at the baby, the transmutation circle on the child's tummy illuminates. The next thing he knows, Ed has all of his limbs! He's in a small room standing in front of a mirror. The reflection of another version of himself stares back at him. Suddenly, sirens ring out! His father enters saying, "It's an air raid!" Edward is confused and so it seems...is his father. However, there's no time to talk...."the Zeppelins are coming!" Returning to the military, we find General Hakuro has surrounded Armstrong and the others. They know little of what their Colonel is planning at headquarters, but they stand behind him even if it costs them their lives. The next scene takes us to the Fuhrer's home. When the military leader questions his son's quiet behavior, Selim admits that he saw his father place something precious into a safe. The Fuhrer smiles telling the boy he may have it when he gets older. Then the Fuhrer gives Selim the key saying, "I'm trusting you with my life. Protect it the best you can!" A moment later, there is a knock at the door. It's First Lieutenant Hawkeye! Outside, the Colonel is secretly making his way in. At the base, the disfigured Archer leaves a trail of bloodshed and bodies in his wake. Izumi and Lieutenant Ross plan their escape. Before disposing of another poor soldier, Archer is told of the Fuhrer's eminent attack. He heads in that direction. In the other world, Hohenheim does his best to explain what is going on to his confused son. "Many people will die," he says. "These lives from the past and those from the future, become the source of alchemy. Not only do you need mass for transmutations, but energy as well." "The lives dying in this world cross the gate and provide energy for our transmutations?" Ed questions. Ed begins to yell at his father about Dante, the love letter, switching bodies, and questions why he married their mother. Hohenheim told Ed Trisha was the first time he ever experienced love. Then he showed Ed his rotting body further explaining why he left them. Meanwhile, from deep within the Fuhrer's home, Envy is coaxing Gluttony to eat Al, who has been placed on a transmutation circle. Gluttony, however, is unable to function without his beloved Lust. That is when Dante pulls out Gluttony's tongue which carries his mark of Ouroboros. She uses alchemy to reduce him to the gluttony inside him; totally destroying his mind. Switching scene's to Hohenheim....he explains that Dante couldn't create the philosopher's stone on her own so she had her eye on you and Al. He said that aside from alchemy, this world is very much like their own....that is why there is a child that looks like you. "Perhaps, somewhere, there is a child that looks like Al," he continues. He tells Ed that his body is still inside the gate, but somehow his soul and mind must have attached to this body. As he is speaking, Soldiers approach Hohenheim saying General Churchill wants to see him. Before leaving, he tells Ed to open the gate within him so he may return to his body. Ed says, "you, too." Hohenheim admits that he cannot, because his body has already crossed the gate. He can no longer use alchemy, but it isn't too late for Ed. He says it's a good thing that the law of conservation is not true. Ed, however, wants to continue to believe, and ponders what he's been told as his father drives off. A few minutes later, the driver reports that a zeppelin is falling. The car comes to a screeching halt. Hohenheim jumps out to see that the area where he had left Ed is now engulfed in flames. From within those flames, Ed (covered in debris and barely able to breath) uses what strength he has left to attempt alchemy. At the same time in the other world, the Fuhrer excuses himself and enters his wine cellar armed with a sword. Colonel Mustang confronts him. The Fuhrer reveals he is a homunculus and tries to convince his subordinate that what he has been doing was for the greater good. "Humans are essentially ignorant, and they wouldn't be able to handle the power of the philosopher's stone," he says. He then declares homunculus...God's Apostles. The Fuhrer begins to attack Mustang knowing the limits of the younger man's flame alchemy. Not far off, Gluttony is salivating at the site of Al. Wrath barges in screaming to bring his mommy back. Envy grabs the distraught boy, and Lyra (Dante) uses the baby to produce the gate. Tiny black hands grab the younger homunculus. His arm and leg are torn from his body. Dante (Lyra), however, lets him live....thinking she might still have some use for him. A frightened Envy points at the door, "It's not disappearing," he says. Suddenly, Ed pushes his way through the doors and back into this world. He realizes the boy in the other world must of died. As soon as Ed passed through that gate, Envy tries to confuse the boy by shape-shifting into Dr. Marcoh, Hughes and even Sloth. Ed is not falling for those tricks as the two exchange blows. At one point Wrath (in his current state) grabs Envy's foot allowing Ed to get the upper hand. 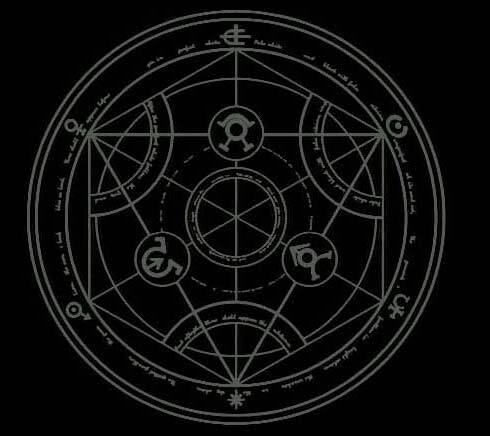 Fullmetal punches any appearance the homunculus uses. It's when Envy shows his true appearance that Ed is taken aback. It's a young image of his father. Dante explains how that is possible. (See Envy's character summary.) That brief moment gave Envy the chance to slice right through Ed's chest. Ed is left lying in a pool of blood. The sight of the dead boy shocks Rose into reality. Her piercing scream ends this episode.